We build award-winning products; but we’ve also built a reputation as a leader in delivering products that minimize waste and are environmentally efficient. EPEAT (Electronic Product Environmental Assessment Tool) is the new standard rating system that ensures you are using electronic equipment that meets specific environmental criteria. This registration ensures EPEAT compliant design, production, energy use and recycling processes based on ANSI-approved public standards. Please understand that the End-of-Life Characterization Report will be available within 1 year of the product release. Authorized Toshiba dealers support Toshiba multifunctional products. Typically, the dealer from which the product was purchased, provides support in the event of product failure. If a product failure is encountered, end user customers can locate an authorized dealer in their area by CLICKING HERE or by calling 888-820-8674. For available upgrades for Toshiba multifunctional products, please CLICK HERE. Spare parts are available for Toshiba multifunctional products for up to 7 years after the end of production. For additional information please contact an authorized Toshiba dealer. An authorized dealer in your area can be located by CLICKING HERE. Toshiba America Business Solutions offers a nationwide recycling program for all Toshiba branded EPEAT registered copiers, printers, multifunctional products (MFP), fax machines, computers, tablets, and televisions. This service extends to residual equipment and components that have no resale value. Toshiba partners with SIMS Recycling Solutions (an R2 Certified Electronics Recycler) for the recycling its EPEAT-certified copiers, printers, MFPs and fax machines. To utilize this program, simply follow the instructions below. Toshiba offers this same service to leasing companies and other authorized agents that retain ownership of Toshiba branded EPEAT-certified product at the termination of lease or rental agreements as well as from trade-ins or exchange of equipment where the previous product needs to be disposed. CLICK HERE for the Recycling Center Locator page. Locate the recycling center nearest to you and click on that state. Ship your product to the address listed on your form. *You are responsible for any shipping and delivery charges. There are no charges to you for the disassembly and recycling process once the product is received at the facility. This process is performed by an R2 Certified Recylcer to ensure all components are handled properly. Toshiba also provides recycling of used toner cartridges. CLICK HERE for more information on this program. Toshiba highly recommends that equipment owner scrubs all data from the product prior to shipping to recycling location. Toshiba assumes no liability relating to data remaining on Toshiba-branded products that are received for recycling. Toshiba offers free mailback for any Toshiba computer (laptop or AIO), monitor, or original packaging. Visit https://us.toshiba.com/green/reuse-and-recycling to learn how to send us your item through the mail. For consumer products such as televisions, dvd players and other electronic waste, visit http://www.mrmrecycling.com/collection_map.htm to find a Toshiba-sponsored recycling center near you. 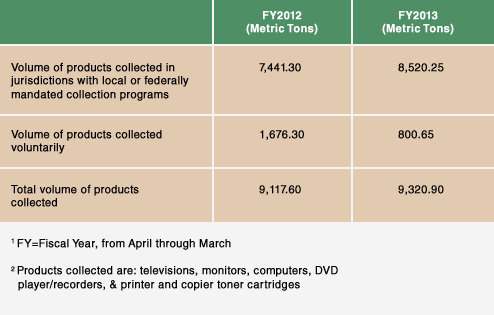 Toshiba discloses the volume of consumer and business product material that is recycled. Toshiba America Business Solutions offers a nationwide recycling program for all Toshiba branded EPEAT registered copiers, printers, multifuction products, fax machines, computers, tablets and televisions. This service is provided to leasing companies and other authorized agents that retain ownership of the product at the termination of lease or rental agreement with their customer as well as the result of trade-ins or exchange of equipment where the previous product needs to be disposed. It is the leasing company and/or authorized agent's responsibility to manage and erase any data existing on any Toshiba-branded equipment. Toshiba assumes no liability relating to data remaining on Toshiba-branded products that are received from leasing companies or authorized agents for recycling. Toshiba partners with SIMS Recycling Solutions (an R2 Certified Electronics Recycler) for the recycling its EPEAT-certified copiers, printers, and MFPs. To utilize this program, simply CLICK HERE to locate a recycling center and follow the instructions. Toshiba practices global environmental management with the aim of realizing a low-carbon, recycling-based society and biodiversity. We seek a combination of business and environmental activities, to maintain and protect the health of the global environment knowing it is an irreplaceable asset for future generations. Toshiba has identified environmental management, eco-products, eco- process, and environmental communication as the important pillars of environmental management and is actively driving environmental protection, to contribute to the reduction of environmental impacts in business fields such as stores and offices. The TOSHIBA TEC Group specifies and promotes objectives and targets for its business activities, products and services to assess environmental impact including biodiversity, reduce environmental impact and prevent pollution, and continually strives to improve the environment. The TOSHIBA TEC Group complies not only with laws and regulations applied in countries or regions all over the world, but also with industry guidelines, which it has endorsed, for environmental protection. The TOSHIBA TEC Group reduces environmental impacts throughout its product life cycle through green procurement of environmentally conscious materials and parts, 3Rs, energy conservation, and abolition of all certain chemical substances, in order to provide ECPs on a global basis. The TOSHIBA TEC Group advances distribution of environmentally conscious products and services to contribute to the reduction of environmental impacts of the products or services when used by customers. The TOSHIBA TEC Group contributes to the establishment of a recycling- based society, while collecting and recycling end-of-use products and reusing used parts. The TOSHIBA TEC Group strives toward resource and energy conservation, as well as correct control of chemical substances for environmentally conscious production, marketing and servicing, allowing for regional situation. The TOSHIBA TEC Group aims at realizing a low-carbon society through "Monozukuri" or by creating environmentally conscious products and by improving the efficiency of logistics operations. The TOSHIBA TEC Group provides environmental education, conducts educational campaigns, and expands each employee's environmental awareness to promote environmental activities. The TOSHIBA TEC Group actively and widely discloses its environmental policy and activities inside and outside the Group. The TOSHIBA TEC Group participates in society-wide environmental activities in cooperation with administrations, communities and bodies concerned. Toshiba has formulated an action plan and monitors the progress of its activities. 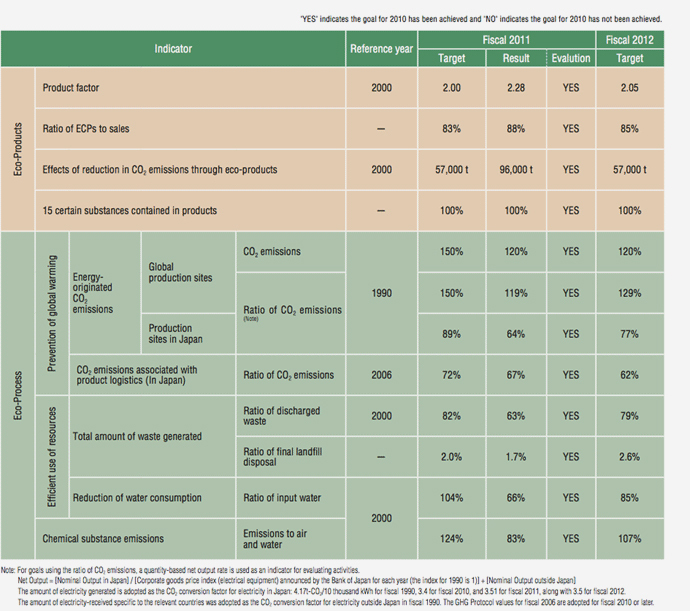 As for eco-products, effects of reduction in CO2 emissions through eco-products and the ratio of ECPs to sales exceeded the goals as new ECPs were released in fiscal 2011. For reduction of chemical substance emissions, all 15 certain substances were abolished from new products as well as existing products. We will continue to develop environmentally conscious products. In regards to eco-process, a new production site was opened in China in fiscal year 2011. This new production site will become engaged mainly in part processing, thus will consume more energy, compared to the existing assembly sites. The rate of energy-intensive manufactured products will increase also in Japan. Therefore, targets for and after fiscal 2012 will be an increase over the results in fiscal 2011. We will continue efforts to restrain emissions of CO2, waste and chemical substances to the fullest extent through improvements in management and deliberate business investment. Measures to reduce power consumption through energy-saving facilities are continuously taken in order to reduce CO2 emissions associated with energy consumptions. 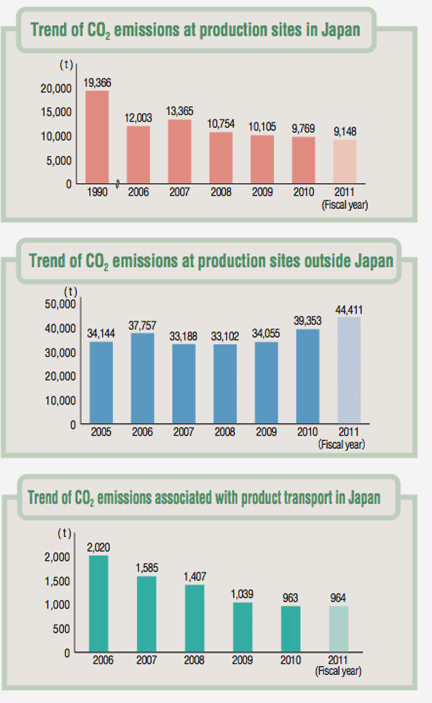 In fiscal 2011, CO2 emissions decreased by 3% in Japan but increased by 13% outside Japan, due to the expanding scale of production, compared with the previous year. Substances covered by the environment-related laws and regulations are classified into three types: prohibition of use, reduction in use and control of release. In terms of reduction in use, the TOSHIBA TEC Group strives to reduce the release of chemical substances, which have a direct impact on the environment. 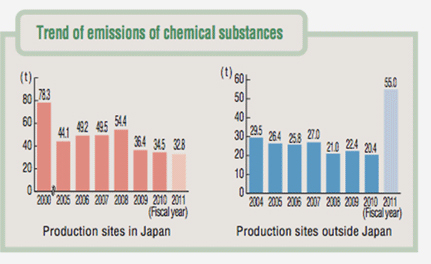 In fiscal 2011, the release of chemical substances decreased by 5% in Japan, compared with the previous year, but the release of chemical substances used for washing parts at parts plants outside Japan increased. The TOSHIBA TEC Group makes efforts to reduce the purchase, waste and emissions of substances with solvent waste recycling machines and powder coating without solvent. To efficiently use resources, the TOSHIBA TEC Group is tackling reducing the total amount of waste discharged, including recycled waste. Returnable containers, which are repeatedly used to deliver parts, are now in full use, resulting in a reduction in the use of corrugated cardboard. 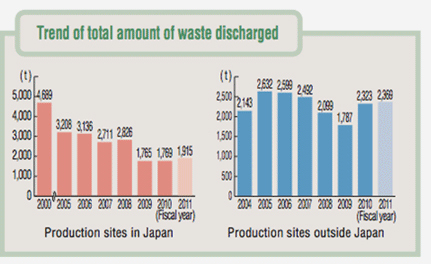 In fiscal 2011, while the amount of waste discharged increased by 8% in Japan due to an increase in sludge to improve the painting process, it remained unchanged outside Japan, compared with the previous year. Toshiba offers an optional take-back service of non-fiber based packaging to institutional purchasers of all Toshiba-branded products for recycling. All customers can use our take-back service at their own cost. We strongly encourage that you recycle plastic packaging locally as it eliminates greenhouse gas emissions associated with transportation. Ship your plastic and other non-fiber packaging to Toshiba’s packaging recycler at the following address. *Note: Shipping is at your own expense using shipping/freight company of your choice. Toshiba receives the plastic packaging and recycles it at no additional cost to you; ensuring nothing goes to landfill. Toshiba devices allow the use of general office paper with renewable content, and paper with pre/postconsumer recycled content, and paper that is chlorine free. At Toshiba America Business Solutions, Inc., all of our imaging products are designed to allow the use of non-manufacturer toners and/or cartridges while simultaneously providing a capability that allows your Toshiba imaging equipment to alert you if counterfeit or non-manufacturer toners are inserted in your copier. Toshiba is committed to preventing the environmental impact of improper disposal of toner cartridges and containers. Toshiba offers a solution through a partnership with Close the Loop Inc. (Ctl), an innovative materials recovery company specializing in the collection and recycling of toner and inkjet cartridges, toner bottles as well as other print consumables. No residual toner, toner containers, or cartridges are disposed by incineration or landfill by Toshiba nor Toshiba’s recycling partner, Close the Loop (Ctl). Toshiba and its recycling partner assure 25% or less of the toner material goes to waste-to-energy depending on the local, national, or regional regulations. CLICK HERE to download a statement of commitment from Toshiba’s recycling partner. No plastic from toner containers or cartridges are disposed by incineration or landfill by Toshiba nor its recycling partner, Close the Loop (Ctl).Toshiba and its recycling partner assures 25% or less of the plastic goes to waste-to-energy depending on the local, national, or regional regulations. Toshiba toner cartridges are not designed to prevent their reuse and recycling.